Small perennial with pinnate basal leaves and a few single stem leaves, roughly triangular, lobed or toothed leaflets, hairy mid-green sometimes with reddish tinging. 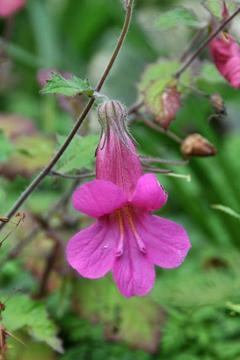 Slender simple or branching stems carry loose, sparse racemes of flared tubular purple-pink flowers in summer. Well drained, humus rich soil in sun or part shade. Will tolerate dry soils and shade. May need some protection in winter and dislikes very wet cold conditions. From seed or basal or root cuttings. Used in Asian herbal medicine. Placement of this genus in the Scrophulariaceae family may be incorrect and is the subject of some debate. It might possibly belong in the Phrymaceae or Gesneriaceae family. All parts are poisonous if ingested.